The Axes command on the Add Chart Element menu in Excel provides access to a submenu of that let you add, remove, and control the scaling of the horizontal and vertical axes for your chart simply by choosing the command that corresponds to the axis placement and scaling you want. The Primary Horizontal and Primary Vertical commands on the Axes submenu work like toggle switches, alternatively adding and then removing an axis from your chart. You can also choose the More Axis Options command to display the Format Axis pane. The best way to find out what the Format Axis pane’s radio buttons do is to just experiment with them. In some cases, selecting the different axis radio button has no effect. For example, you can’t select the Date Axis option under Axes Type unless your chart shows time series data — and Excel realizes it. 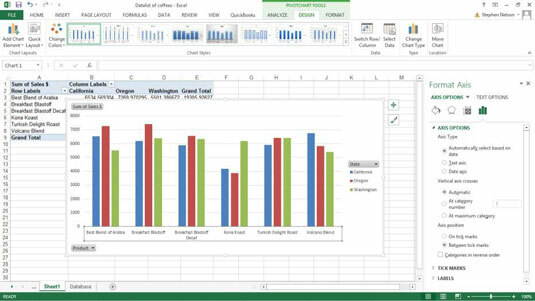 If you’re working with Excel 2007 or Excel 2010, you use the Axes command on the Layout tab (which displays the Format Axis dialog box) to change the appearance of the chart axes. You can select the Format Axis pane’s Categories in Reverse Order check box to tell Excel to flip the chart upside down and plot the minimum value at the top of the scale and the maximum value at the bottom of the scale. If this description sounds confusing, just try this reverse order business with a real chart.